Encompassing firms to apply green policy in a holistic management practices are strongly required in order to maintain competitive advantages and experience long-term marketing performance. This current empirical research is aimed to fill the lack of empirical findings and empirical studies on firm's innovative concept. 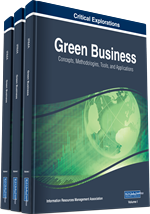 Green-based product innovation, green management practices and green corporate image are presented as the antecedents and postulated as the sources of sustaining firm competitive advantages. A questionnaire-based survey was deployed to collect data from Large Scale Enterprises in Indonesia with Top Management, Operational and Marketing Managers served as respondents. 500 questionnaires were mailed and 388 were valid for further analysis. Data was analyzed by using Confirmatory Factor Analysis (CFA) and Structural Equation Modeling (SEM) via AMOS statistical software. Statistical findings demonstrated that green-based product innovation, green management practices and green corporate image significantly has a positive affect to sustain firm competitive advantages which is led to enhance long term marketing performance. However, green-based product innovation plays insignificant direct relationship on long term marketing performance. This study discusses some managerial implications for enterprises and recommendations on a basis of green implementation. (Al Nawayseh and Balachandran, 2012), holistic sustainability of tourism attractions (Ottenbacher, Schwebler, Metzler, and Harrington, 2015), green new deal to seek for knowledge, Sustainability, and green development (Barth, 2011). The green side of materialism in emerging BRIC and developed markets (Strizhakova and Coulter, 2013); The effect of green messages on brand purchase and brand rejection (Wheeler, Sharp, and Nenycz-Thiel, 2013); The influence of private labels on retailer cooperation (Zippel, Wilkinson, and Vogler, 2013); The nature and incidence of private label rejection (Nenycz-Thiel and Romaniuk, 2012); Understanding efficiencies behind logistics service providers’ green offerings (Isaksson and Huge-Brodin, 2013). Besides focusing on green product labelling, the most recently trending topic in green is green environmental. green management and environmental (Teixeira, Jabbour, and Jabbour, 2012); From shadow to green (Markandya, González-Eguino, and Escapa, 2013); environmental technology sector green (Guziana, 2011); Green teams: understanding their roles in the environmental management (Jabbour, Santos, Fonseca, and Nagano, 2013); environmental management capability (Wong, Lai, Shang, Lu, and Leung, 2012); Environmental innovations and profitability (Ghisetti and Rennings, 2014); environmental innovation embedded within high-performance (Antonioli, Mancinelli, and Mazzanti, 2013); effects of environmental policies (Saltari and Travaglini, 2011); How green is Environmental gardening identity (Kiesling and Manning, 2010); green and profitable sustainable (Figge and Hahn, 2012); Embedding “substrate” in environmental assessment of green (Peri, Traverso, Finkbeiner, and Rizzo, 2012); Going green or going away (Zhu, He, and Liu, 2014).